Tel Aviv, Israel, is hosting the 64th Eurovision Song Contest! with the Grand Final on Saturday, May 18, 2018. It’s the first day of Passover. It’s Easter weekend. And it’s our Annual ESC Countdown Gala where we celebrate and dance to this year’s entries (and of course, our all time ESC and Schlager favorites). 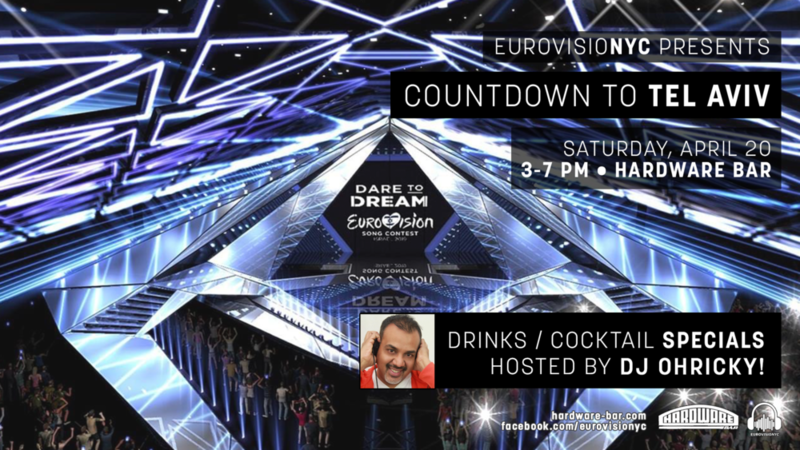 So come and #Join Us and your fellow Eurovision Song Contest dreamers and lovers at Hardware on 4/20 starting at 3pm. The second wave of tickets for this year‘s competition will start tomorrow, Tuesday, April 16 at 11AM Eastern. During this time, tickets will also be sold for the live shows including the Grand Final. From Cyprus to Azerbaijan. Semi Finals Running Order Revealed. It’s official. The running order of each of the semi finals is now revealed. Cyprus got the honor of opening the first semi final while Azerbaijan will conclude the second semi final. The running order is determined by the producers of the show, and is approved by the Executive Supervisor and the Chair of the Reference Group. VIDEO: Courtesy of eurovision.tv YouTube Channel. The Postcards. ISRAEL like you have never seen it before.